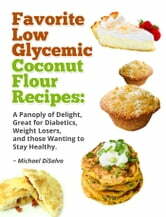 When you think of low glycemic recipes, what do you think? Some think of recipes for diabetes or diabetics, some think of trying to lose weight, others think of preventing diabetes in the first place. Enter COCONUT FLOUR! While many people understand the benefits of coconut flour, not many people are aware that it is not only low sugar, gluten free, and wheat free, but also can be a tasty treat for those losing weight, dealing with celiac disease, or starting a low carb diet. In Favorite Low Glycemic Coconut Flour Recipes, we offer you recipes, most of which are paleo friendly, to achieve your health goals while enjoying some delicious meals and treats in the meantime. Great taste does not have to be synonymous with high sugar. In fact, we combine not only savory, but also "sweet" recipes that are safely in the limits to what most diabetics can stand. You will be surprised by the alternatives that can change your life when you though that no longer could you have a sweet tooth. : ) We&apos;ve worked hard to change some traditional recipes associated with cavities, bloating and a high GI Index, and we&apos;ve streamlimed them replacing ingredients not really good for you with some hot alternatives-- yes, even superfoods. With the stamp of approval of our very discerning one- and three-year-olds, we are sure you will enjoy every bite. No, no holds are barred as we explore the panoply of taste and expose the sugar industry for what it is: a vampire sucking America&apos;s (and the world&apos;s) health. BBQ Recipe Book: 70 Of The Best Ever Healthy Barbecue Recipes...Revealed! Barbecue Recipes: 70 Of The Best Ever Barbecue Fish Recipes...Revealed! Barbecue Cookbook: 140 Of The Best Ever Healthy Vegetarian Barbecue Recipes Book...Revealed! Vegan Cookbooks: 70 Of The Best Ever Delightful Vegetarian Lunch Recipes....Revealed!